Stamping letters into metal can lead to many lovely personalized projects for yourself and friends. Monogrammed projects make excellent gifts for showers and birthdays and add personality to scrapbook covers. When stamping letters into metal, it’s important to practice first. 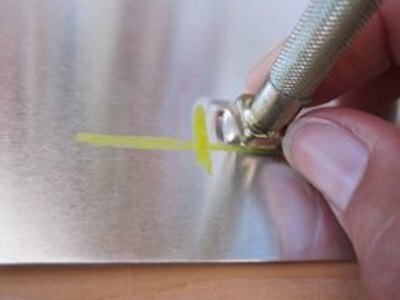 If you are using blank pendants, you may only have one shot, so it's a good idea to buy sheet metal -- available at hardware stores -- to perfect your hammering and spacing before going for the real thing. Sheet of metal .016 x 4" x 10"
Metal lettering stamping sets are widely available in craft and hobby stores, many at quite reasonable prices. A good quality set should last through many projects, so it's worth the investment. You probably already own most of the other supplies you'll need for this project -- they're quite simple. Using your ruler and grease pencil, draw a line where you want your letters to be. Place sheet metal on a slab of wood. You need the wood to absorb the shock of hammering into the metal. Place your first letter on your drawn line. Hit the hammer once very firmly. If you move your letters while hammering, the letter will shadow, so hold your letters nice and steady. It is a good idea to practice before actually hammering into your final piece. Evenly space your letter next and hammer in your letters, keeping firm, even pressure on your hammer. To maintain even spacing with some letter sets, you can put the block for the next letter right up against the first letter, butting up the block to the actual letter. Every set may be different, however. Rub off the grease pencil mark with your fingers. Fill letters with a permanent pen. Work quickly, or the ink will dry and be hard to get off in the next step. Gently rub off the excess pen with a rag. The letters will be filled with the ink in the lowest point of the ditch. If you are hammering into a precious blank for a necklace or a special project, practice, practice, practice on another sheet of metal. It takes a few times to figure out the correct force needed to make the perfect impression. Too little and it may just dent the metal, too much and the impression may include the edges of the stamp.